On April 22, 2012 (Sunday), the Philippines will celebrate the 2012 World Book and Copyright Day with a one-of-a-kind “school fair” at the Planas Garden, Quezon Memorial Circle. 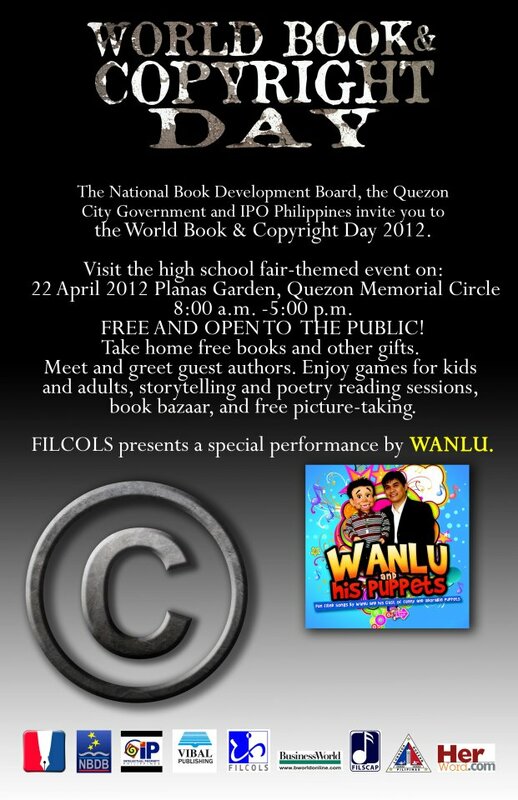 The National Book Development Board, the Quezon City Government, and IPO Philippines have partnered with FILCOLS, FILSCAP, and Vibal Publishing to organize a special celebration for the general public, highlighting the importance of books and copyright. The event is from 8:00 a.m. to 5:00 p.m. Admission is FREE. Just like a real fair, booths will be set up and prizes will be given away. There will also be special shows, including a segment by WANLU, the famous ventriloquist, at 2:00 p.m. Other activities include storytelling, poetry reading, and free picture-taking with a “pirate” and other crime lords, to draw the public’s attention to the fact that piracy is a punishable crime. This photo booth will be put up by Filipinas Copyright Licensing Society, Inc. (FILCOLS). For more information, please get in touch with Beverly Siy through +63.919.3175708 or email: beverlysiy@gmail.com.